George Bakris is a nephrologist/hypertension specialist who dedicates his time to the diagnosis and reduction of high blood pressure, particularly in complicated and refractory cases. He is skilled in the treatment of kidney disease, with special expertise in diabetes-related kidney disease, where he has spent over 25 years on clinical trials focused on slowing its progression. In his research activities, Dr. Bakris explores why the rate of kidney disease is significantly higher in the African American population compared to other ethnic groups. The guideline discussion between the US and the EU has been brewing since both were released. 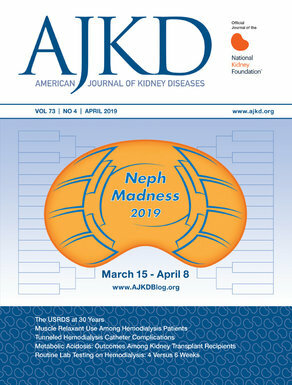 The NephMadness Hypertension Region scouting report did a very fine job outlining the balance of evidence between the two guidelines and the recommendations focusing on chronic kidney disease (CKD) and role of blood pressure (BP) measurement and monitoring. However, there are some key factors for our evidence-based gurus. We are dealing with biology and NOT physics; thus, the data are only as pristine as groups studied and the design used. Meta-analyses do not save us from these factors. Specifically, as was noted in the KDIGO BP guidelines, there is a high-quality evidence base for BP < 140/90 mm Hg for slowing CKD progression but not for < 130/80 mm Hg, meaning that the recommendation does not justify a rating of ‘1A’ as far as slowing CKD progression. There are 3 randomized prospective long-term outcome trials supporting this: AASK, REIN-2, and MDRD. SPRINT, while not powered for kidney outcomes, also failed to show an additional kidney benefit at systolic BP at 120 mm Hg compared to 140 mm Hg. However, it did reduce cardiovascular (CV) events in the CKD group. So, let’s be true to the data and not extrapolate since we don’t like the answer. The truth is for CKD the data are exclusively for nondiabetic kidney disease. Yes, post-hoc analyses of trials in patients with diabetes and CKD also show benefit at < 140 mm Hg but nothing additional at < 130 mm Hg, and those studies would not be considered Level 1 evidence. This is also true for CV outcomes in patients with diabetes (Emdin et al; Ettehad et al; Thomopoulos C et al; Wan EYF et al; and others). The key factors are how much CV risk you have coming into a trial and your BP. A prospective trial in Japan (J-DOIT 3) randomized over 2,400 people with type 2 diabetes to 2 different levels of BP and showed no difference in CV outcomes at BP < 120 mm Hg. However, baseline BP was 134 mm Hg; this was also seen in HOPE-3. Thus, it is the level of risk that should determine your BP goal, noted both in EU and Canadian guidelines. I agree as well regarding one size, i.e. BP goal, not fitting all. Unfortunately, some of the senior authors of the US guideline tried to mandate a prevention and treatment strategy into one guideline. This is fine if a clinician is only seeing people 20 to 55 years of age; unfortunately, that is not common practice. The EU guidelines have far more equipoise and are balanced for a greater spectrum of patients. While there is significant equipoise between the US and EU guidelines for over 90% of the recommendations, the EU guidelines emphasize that it is not only different patients’ risk levels that should be accounted for but differences in vascular compliance that would not necessarily allow some of these more dramatic BP goals to be tolerated by patients. The evaluation of primary hyperaldosteronism (PA) is thorough and well-done. The algorithm is very useful and important especially for nephrologists who do not commonly deal with this issue. One issue not touched on is that of adequately addressing whether aldosterone receptors have been properly blocked. Generally, a dose is picked between 50-150 mg daily and then we monitor potassium and feel if it is in normal range we are out of trouble. Interestingly, this is not the proper variable to monitor if interested in mortality benefit: recent data have found that plasma renin activity is the marker that correlated best with CV mortality rather than potassium levels. Hundemer et al conducted a cohort study including 602 patients with PA treated with MRAs and 41,853 age-matched patients with primary hypertension (PH) to investigate the risk for incident CV events including death. They found that while both groups had comparable CV risk profiles and BP throughout the study, the incidence of CV events was higher among patients with PA on MRAs compared with patients with PH (56·3 versus 26·6 events per 1,000 person-years). Compared with PH, the excess risk for CV and mortality was limited to patients with PA whose renin activity remained suppressed (<1 μg/L/h) on MRAs (adjusted HR = 2·83 [2·11, 3·80] and 1·79 [1·14, 2·80], respectively) whereas patients who were treated with higher MRA doses and had unsuppressed renin (≥ 1 μg/L/h) had no significant excess risk. Thus, targeting MRA therapy to raise renin may mitigate this excess risk.